Good Stuff NW: "Hunker Down Eating"
Watch Oregon's Food System Changing! Want to Reverse Climate Change? Have a Beer! Whether yesterday's windstorm was a blowout or a blowhard (see photo of the toppled tree in Northeast Portland, below), it's just a harbinger of winter weather to come. This recipe from contributor Jim Dixon of Real Good Food is perfect for cold weather when hardy winter greens like kale and collards are at their best. After the first frost, these plants put out sugars which act as antifreeze and make them sweet and tender when cooked! During wet and wild weather I want to eat hot, comforting bowls of beans and greens. 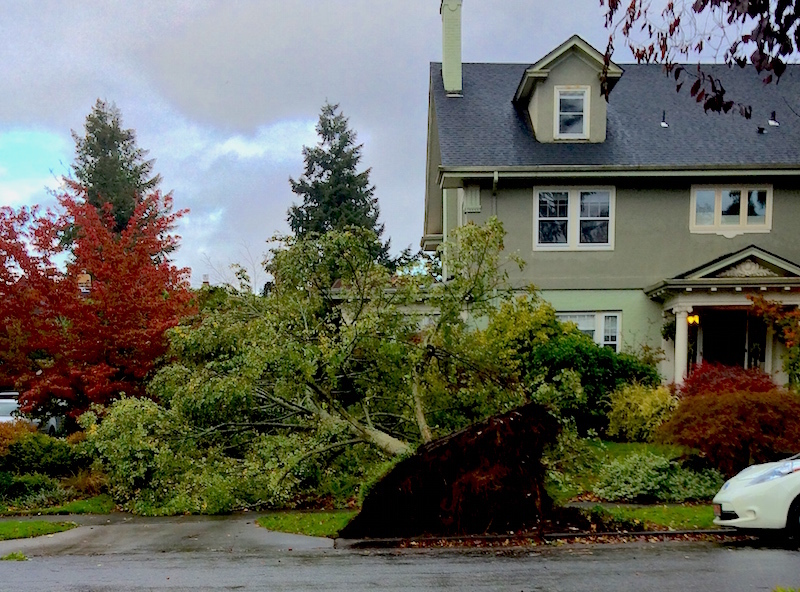 Tree toppled in windstorm in Northeast Portland. If you cook beans a couple of times each week like I do, you'll always have some on hand ready to heat up. Here's how I make the greens. 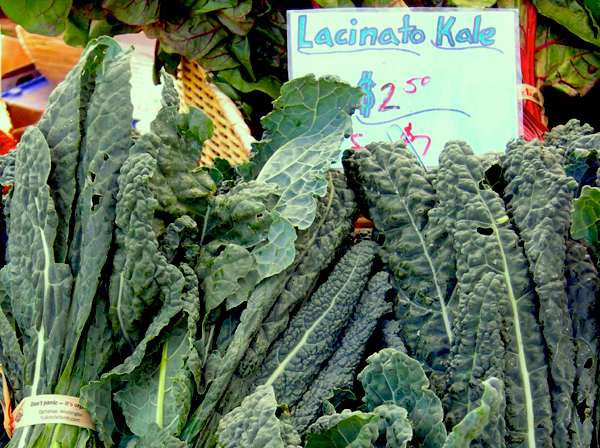 I think cavolo nero (aka Tuscan kale) and collard greens taste better than curly kale. My basic approach is to braise them with onion, olive oil, salt and water. The secret ingredient is time; these sturdy greens are best if cooked for at least 45 minutes. More tender greens (chard, spinach, beet, etc) cook more quickly, so they usually just get a quick sauté. Chop an onion and start cooking it in enough extra virgin olive oil to cover the bottom of your pan (anything with a lid will be fine). While the onion cooks, chiffonade a bunch of greens: Roll several leaves at a time into a tight bundle and cut into quarter-inch slices. Or stack several flat and slice them. I like to cut these ribbons into pieces about 2 inches long for easier eating. It isn’t necessary to cut out the central stalk; you’re going to cook it tender. Add the greens to the onion along with some salt and at least a cup of water; use more water if you want more pot likker. Cover, reduce heat to simmer, and cook. Check after 20 minutes and add water if needed to keep the bottom of the pot covered (I’ve burned greens more than once; if they're not completely black just say they’re “caramelized"). Let them simmer for at least 45 minutes; longer is okay (but check for water). Drizzle with a bit of fresh extra virgin at the table.